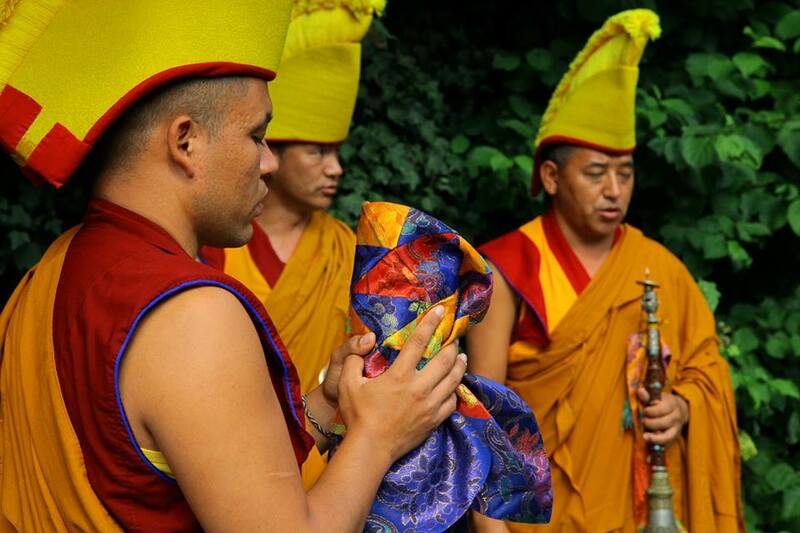 In mid-summer 2015 the Hive hosted a photography exhibition as well as a mandala creation and destruction ritual by monks from the Tashi Lhunpo monastery. 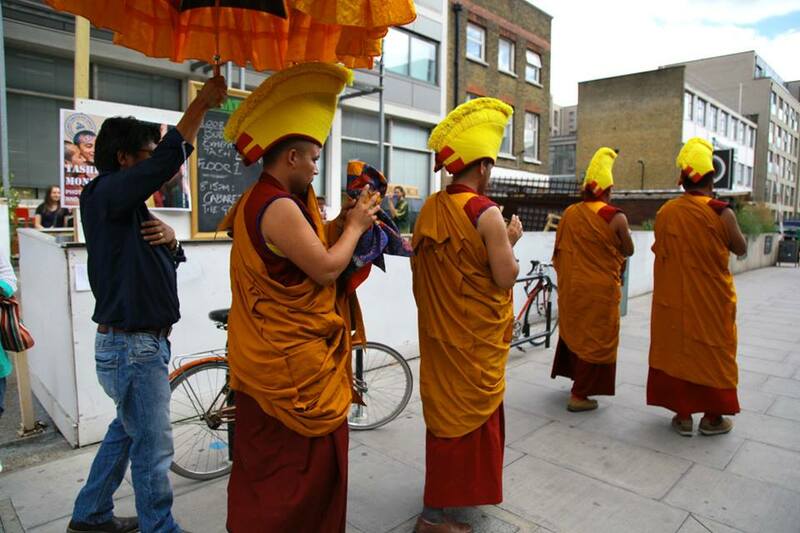 This wonderful event was organised by the Tibet Relief Fund. Photographer and Buddhist Geoff Harris, recently travelled to the Tashi Lhunpo monastery and spent a week photographing the Tibetan Buddhist monks and their activities. 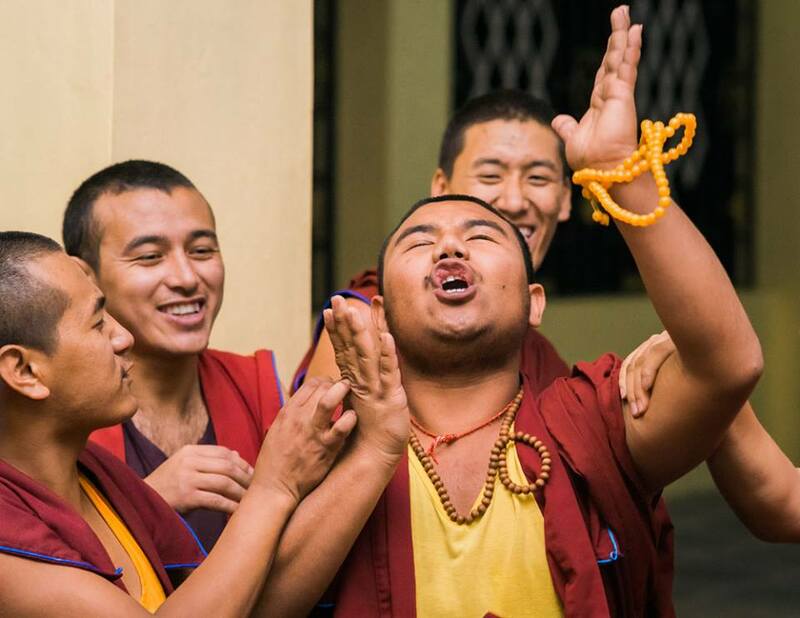 His shots paint a vivid picture of monastic life; debating sessions, cooking and Losar celebrations are just a few activities you can see in Geoff’s photos. 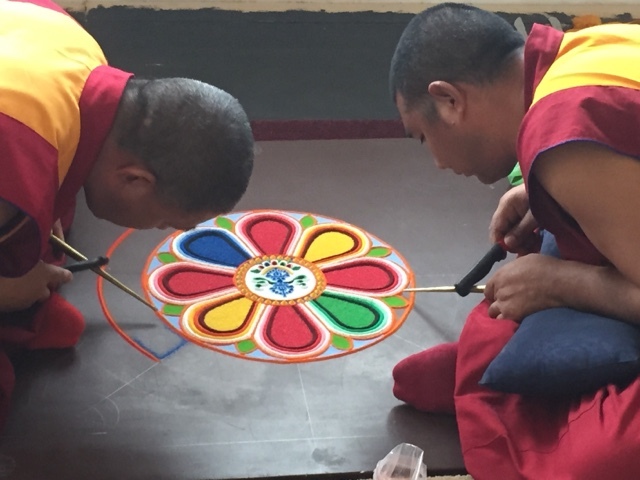 Over the course of two days, a number of Tashi Lhunpo monks created a sand peace mandala in the Hive. 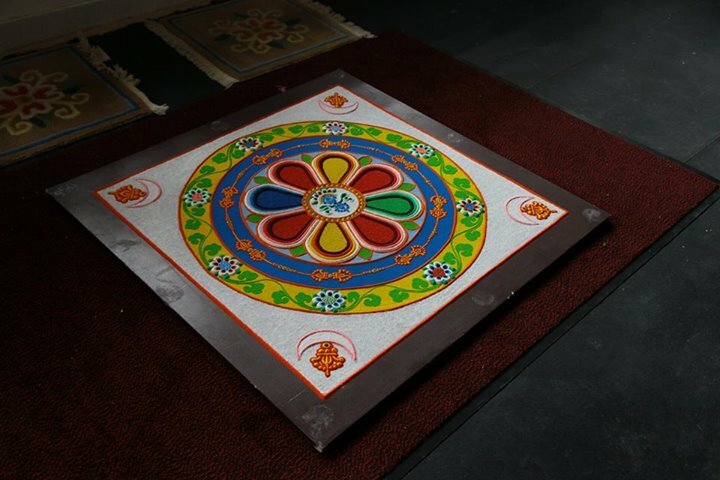 It was a beautiful and intricate design created by carefully dropping coloured sand over a flat base. 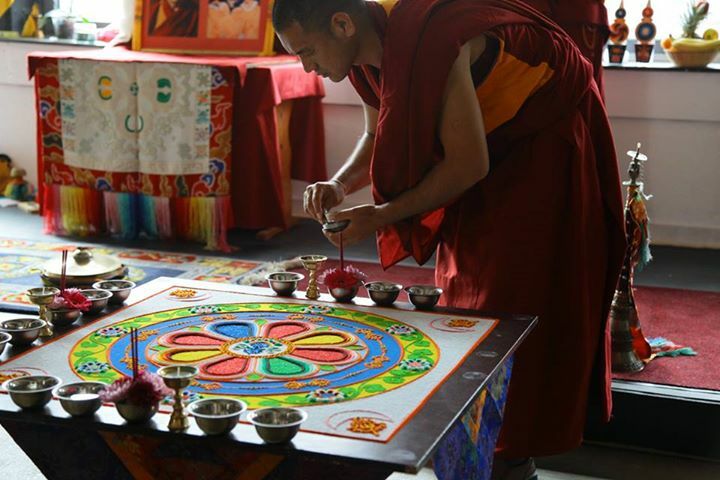 Once the Mandala had been created it was surrounded by offerings of food, flowers, incense and water. 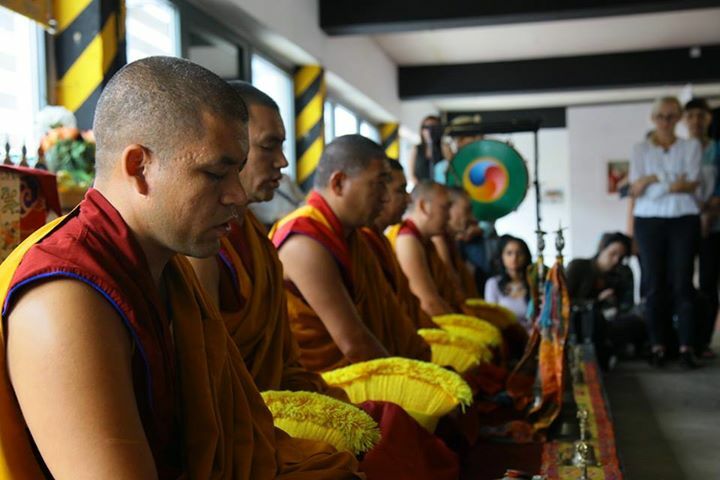 The monks prayed, chanted and played traditional instruments before destroying the Mandala. 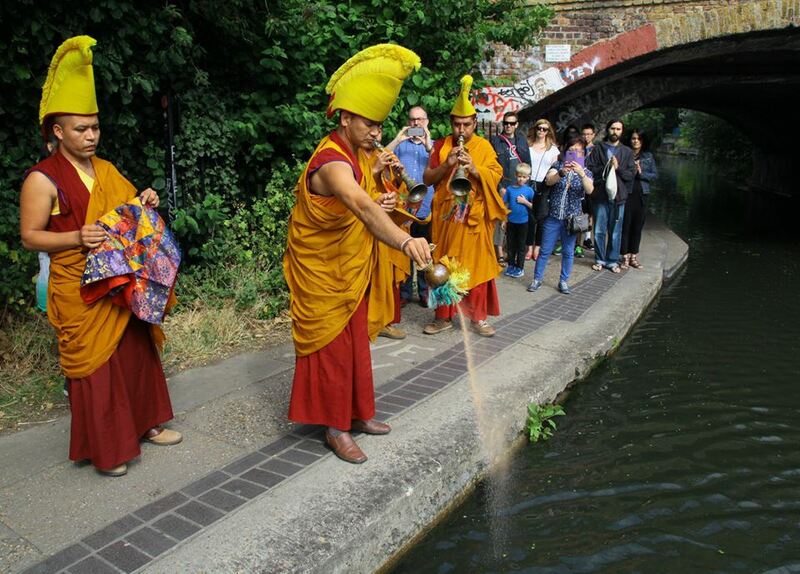 After the distruction of the Mandala, they led a procession down Kingsland Road to the canal, where some of the remnants of the Mandala’s colured sands were tipped into the water. 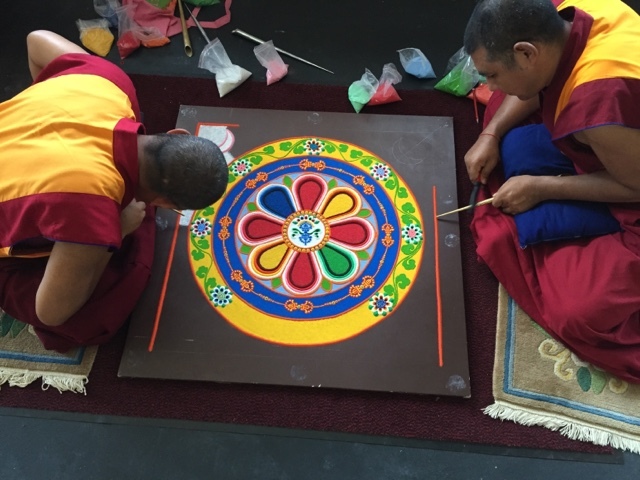 One of the most famous practices of Tibetan monks is the creation of intricate Sand Mandalas, which are believed to emanate healing and purification.The practice of making Mandalas exists throughout Buddhist traditions worldwide, but Sand Mandalas are unique. 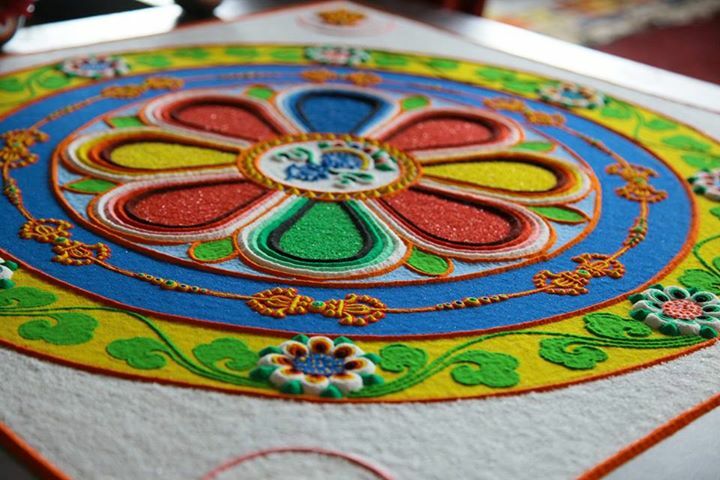 Instead of being woven or painted, Sand Mandalas are made of millions of fine grains of colored sand. 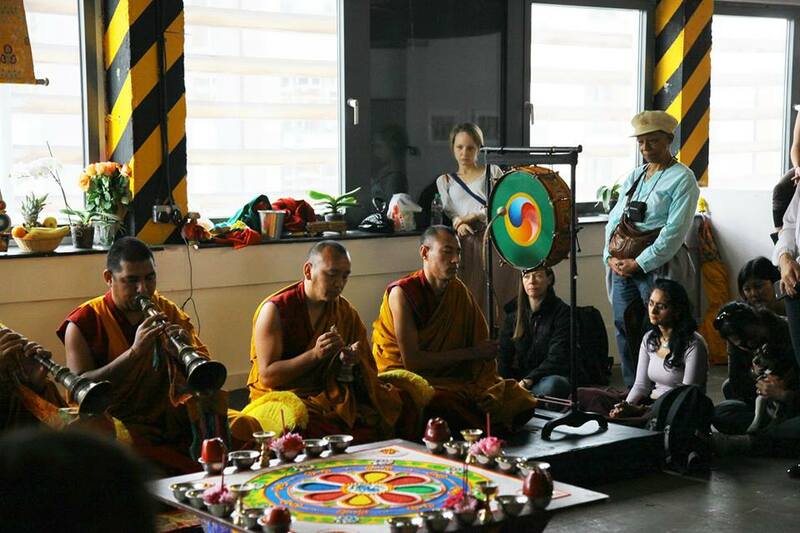 First, the site is blessed with music and chants and then a high-ranking priest will choose the location and the design.During the creation of the Sand Mandala, other monks chant and pray, calling upon the deities thought to reside within the design. 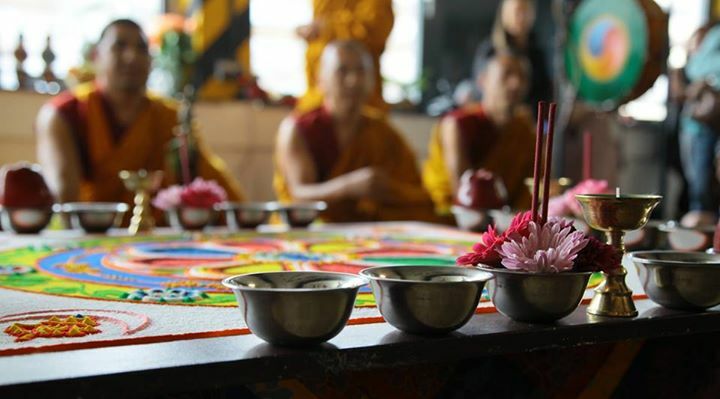 Buddhists believe that this releases the positive healing energies of the Mandala to those who view it as well as to the surrounding environment.The ceremony is concluded with the destruction of the Mandala, which signifies the Buddhist belief in the impermanence of life. 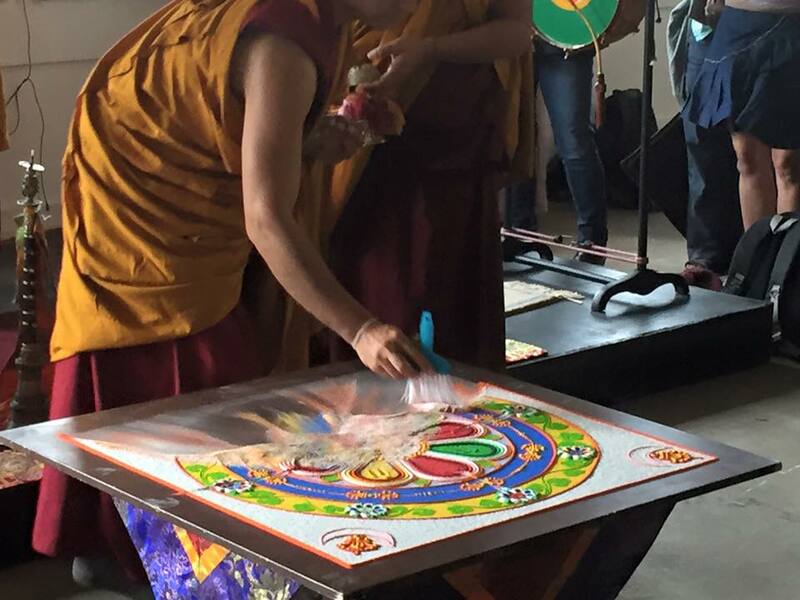 Afterwards, the sand from which the Mandala was made will be brought to a river or stream and cast into the flowing water in order to disperse the healing and purifying power of the Mandala to the world. Often, half of the sand used in the design will be distributed to the laity by the monks, further highlighting the Buddhist belief in sharing its blessings with all. Tibet Relief Fund was founded in 1959 to help Tibetan communities in need. 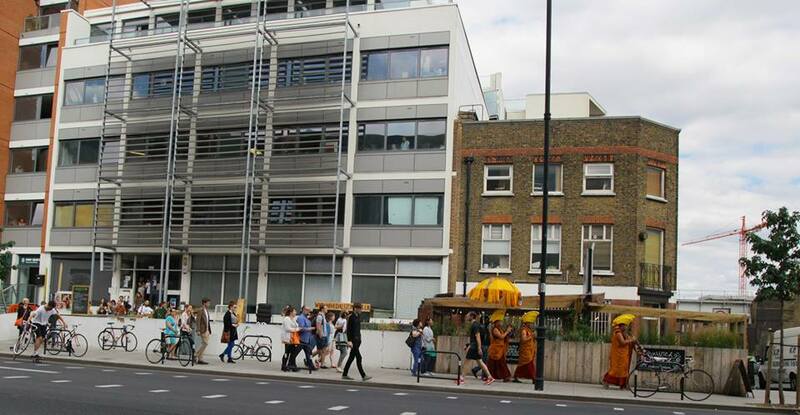 Today they continue to work with Tibetans in India, Nepal and Tibet through local projects that address basic needs and provide vital healthcare and education. 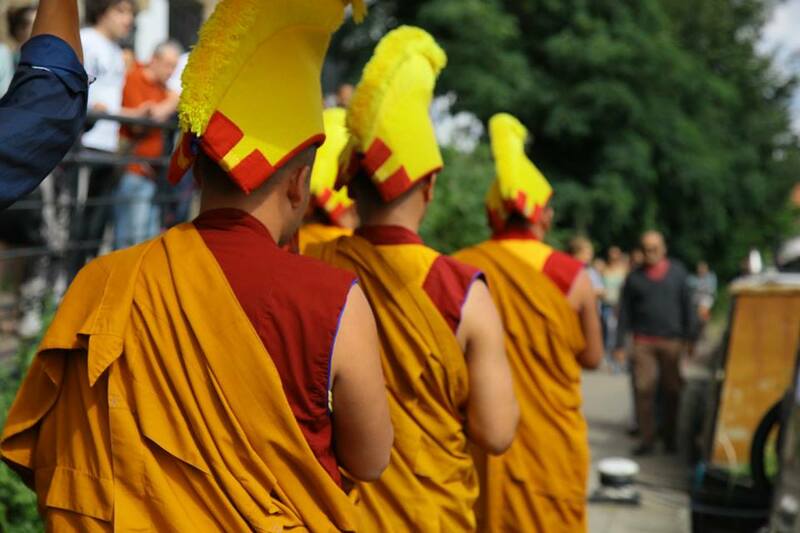 They also respond to emergencies and promote self-sufficiency in Tibetan communities to help them build a positive future.